Also known as Sham Battle and Laying Siege. Similar games in Solitaire Plus include La Belle Lucie. • A tableau of forty-eight cards, in eight horizontal piles each containing six cards. • The Aces are removed after shuffling, and one Ace is placed in each of the four foundations arranged in the center of the tableau. 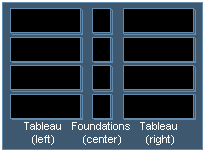 • Build tableau piles down in value. • A space made by clearing a pile may be filled by any available card from the tableau. Strategy: Survey the tableau and identify the pile that has the best chance of being cleared. Work toward clearing away one or two piles as soon as possible. It is sometimes necessary to delay moving cards to the foundations in order to make use of the cards in builds necessary to clear a tableau pile. The game is difficult to win if at least one tableau pile cannot be cleared early in the game.